Tamanna is on a roll. Her Telugu film Happy Days has set the box office on fire while her Tamil film Kalloori is one of the most talked about films in recent times. She has now signed a film with Tamil superstar Surya, produced by AVM and directed by national award winning cinematographer, K V Anand. She has three Telugu films in her kitty as well. In fact, Tamanna is being touted as the most promising actress in both film industries. 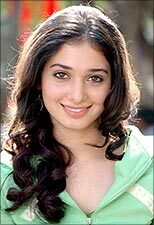 Few know that Tamanna started acting at the age of 13. Now, at 18, the actress is juggling acting, endorsements and schooling. She has just enrolled for a Bachelor of Arts (BA) degree course in Economics. Radhika Rajamani chats with Tamanna to know more. Your performance in Happy Days and Kalloori have been appreciated. What is your reaction? The success is because of good directors like Sekhar Kammula and Balaji Sakthivel. I'm glad I worked with them. It's been a fruitful experience and I have learnt a lot as an actor. Whatever they have taught me will remain with me. Both films are college-oriented. How different was in acting in them? College is the only similarity in those. The stories are different. Happy Days is about urban college life. In Kalloori, I play a girl from an urban area who goes to the rural area. All the characters in the film are from the lower strata of society but from different backgrounds. Happy Days was to do with eight people on campus who become couples by the end of the movie. In Kalloori, there is love but the hero and heroine do not even express their love for each other. The movies are shot differently. Sekhar believes in positivity. Balaji likes to show stark reality. How different were the films in terms of your characters? Sekhar sir told me gave me a character sketch of Madhu. Within certain limitations, I had to create the mannerisms, body language and nuances. We had rehearsals before the shoot. There was a lot of improvisation later. I signed Kalloori two and a half years ago on the basis of a single line -- that is, a city girl comes to the village. On the sets, Balaji sir would enact the scenes out. In a way, he did my homework. The film was his visualisation and I did what he asked me to do. In both the movies you were paired opposite newcomers Varun Sandesh (Happy Days) and Akhil (Kalloori). How was the experience of acting with them? Since Varun spoke English, it was easy. In fact, the entire Happy Days cast did. We got along well and the chemistry showed on screen. In Kalloori, I could not talk to Akhil as he did not know English. There was not much of physical proximity too in terms of expressing our love and the scenes were mostly done separately. You sport a simple look in both films. When I came to Hyderabad to shoot for Happy Days, I used to wear contact lenses. Sekhar sir did not want me to use them so I did not. Even my clothes were simple; what a college girl wears today. Balaji sir doesn't use much lights -- he uses only reflectors. So, one cannot put on make-up. Even the clothes were in sync with the story. Since the story was set seven years ago, my salwar kameezes were loose and ill-fitting. Both these directors have their heroines covered from head to toe in a sari or lehnga-odni and yet, they make them look glamorous. You have acted in Tamil and Telugu. How do you surmount the language barrier? It was tough initially but now I can memorise dialogues quickly. I tried to dub for Happy Days but could not. I may be able to do so in future. You are being spoken of as a new star. I believe certain films change an actor's career, take them to stardom and ensure popularity. They touch people's hearts. I am glad I am known through Happy Days and Kalloori. I always wanted to be an actress and the dream has come true so beautifully. It has a lot to do with luck. God has been kind to me. You have a Tamil project with K V Anand, produced by a big banner AVM. You are cast opposite Surya in the film. Tell us about it. I am a huge star of Surya. I have watched his films. I am waiting to meet him and take his autograph! I'm glad to be part of this project. Anand sir is technically very good and working with such people will be a good experience. It is a prestigious project and I feel humbled to play a role in the film. For me, it's a big thing. I also have another Tamil film produced by Oscar films and directed by Gandhi Krishna. All I can say is that it is a different character which I haven't done before. I will be acting opposite newcomer Siddharth. You have three Telugu films too. Yes. My film with Sushant (Nagarjuna Akkineni's nephew) is on the floor. This is a comedy. I used to think comedy is a lot of fun but it's tough initially. Sushant is down-to-earth and hardworking. He dances, fights and acts well. He is a promising actor with a great future. I will be doing a film with Allu Arjun and working in a M S Raju production too. How did you manage acting and school? My teachers at Maneckji Cooper school (Mumbai) were very supportive. In fact, actors like Padmini Kolhapure and Rani Mukerji studied here. I was more of a dancer actually. Though I was not trained in dance, I had the flair and I would dance at all family functions and choreograph dance shows in school. I was so much in awe of film stars that I thought I was a heroine. I grew up saying Sridevi's dialogues. When I was in class 8, a friend told me to attend a seven-day course with her at Prithvi theatre. This opened me up to acting. My teacher, Neeraj Kabi, wanted me to join his group. I did, for a year. Then I got the offer to act in a Hindi film. My name was recommended to the producer by a teacher. My Fair and Lovely ad got me offers from the South. When I was giving my 10th board examinations, Mohan Babu sir was searching for a heroine to act opposite his son Manoj in the film Shri. I had my English examinations that day and I met him and got the role. If I had not been an actor, I would have been a doctor. I was keen on being a doctor as there are quite a few doctors in my family. Have you got any offers from the Hindi film industry? Yes, but I want to make a mark in the South. Hyderabad and Chennai are like home to me.